Photo: Glen Stubbe, Star Tribune. Star Tribune’s Richard Chin refers to Brian Krohn ‘08 as a “Minnesota Genius” in his article. 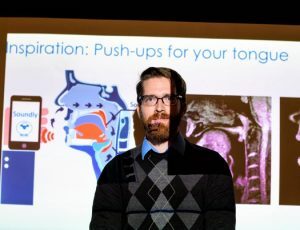 Among Krohn’s creations are surgery tools, wizard staffs, a cycling workout app, and more recently, Soundly, a cell phone application designed to help people who snore by getting them to play a voice-activated game to strengthen their upper airway muscles. While at Augsburg, Krohn switched majors from film to chemistry, that’s when his interest to becoming a scientist began. His undergraduate research led him to “Good Morning America” where he talked about a process to produce environmentally-friendly fuel, which was later commercialized in the development of a $9 million pilot plant. “A lot of times I get a little bug about something, I kind of just do things and see where they go” says Krohn about his ventures. Read full story at the Star Tribune site.